Count On Over 30 years of Industry Leading Expertise in Hydraulic Hoses and Hydraulic Hose Fittings. From low-pressure suction and return, to thermoplastic and flame-retardant, to fire suppression and Teflon, GT has your hose, for your requirements. Our hydraulic hose fittings inventory includes stainless steel hose fittings, brass, aluminum and TFE-lined hoses for any industrial hose application. We recommend GT's low pressure suction and return hydraulic hoses for petroleum or water-based hydraulic fluids in suction lines or in low pressure return lines. We proudly carry American made Couplamatic Systems couplings, quick disconnect couplings, hydraulic adapters, hydraulic hose crimps, sleeves and hydraulic hose flange kits for thermoplastic and hydraulic applications. 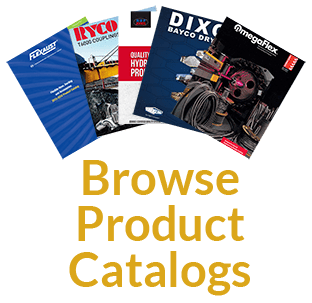 We also carry hydraulic fittings, couplings and kits from trusted brands like Ryco, Kurt Hydraulics and Dayco Products. With hydraulic hose fittings ranging from one-piece crimp to field-reusable, we have the right industrial couplings and quick disconnect couplings for the job.